A Joomla! Pizza Bug and Fun event 8th of September 2018 - originally planned for Germany, but now takes place in many countries across europe. This wiki will be used as the central resource for coordinating efforts and accumulating results from this event. Whether you are a newbie, beginner or professional, graphic designer or programmer, whether you have an agency or a club site, whether female or male, whether young or old. We are happy about everyone who already works with Joomla! or wants to get to know Joomla! first. Only the interest in Joomla! counts. Everyone is welcome here. On 8th of September 2018 we would like to invite all Joomla-enthusiastic users, regardless of their previous knowledge, to make Joomla! even better. We are grateful for any support! Participation is free, non-alcoholic drinks and a pizza included. Joomla 4: Joomla 4.0 is on the horizon, but over 200 bugs and feature requests are untested, which means, they cannot go into the Joomla core. Documentation: There are lots of untranslated Documents, Tutorials and Help Screens. At the PBF Event we hope to translate a lot of it to give Joomla! users as much information as possible in their language. Patch testing: As a main rule, new functions for Joomla have to be tested before they can be merged into an official release. Usually it takes only a few minutes and Joomla becomes better and better. Q: Where can I register if I want to join? A: Contact a Joomla! User Groups (JUGs) near you or write a mail to Benjamin Trenkle . Q: I can't come to a location - can I join online? A: Yes! You only need a computer and internet, but unfortunately you have to order a pizza by yourself. This PBF is organized by local Joomla! User Groups (JUGs) in Germany. You can find more information on the special event page: pizza-bugs-fun.de (german). Do not hesitate to send an email to Benjamin Trenkle  or search him in Glip. For sharing information in the social media please use this hashtag: #pbf18de. If you want to get people together and have a venue to share, please add it below. Share as many details as possible, like exact location, URL for more information about the venue, ways to register, date and time when the venue is available etc. If you have any questions regarding this, feel free to contact Benjamin Trenkle (). To get write access to this wiki you will need to register here first. Please be aware that the registration process requires a valid email address. If you are traveling to one of the physical locations you are advised to ensure that you have registered on this wiki and have a valid login before you travel. You don't need access to your email account after registration. All contributions must be in English. Note that the official language of the Joomla Project is British/Australian English. In the Glip Chatroom you can ask questions and exchange ideas. Glip and GitHub you need for example if you want to test patches. Option 1: The online PBF environment is available shortly before the PBF event and is also suitable for participants with little system knowledge. Option 2 allows you to set up a local installation on your device. Instruction you can find here (german). If you don't want to test patches but still want to give back a lot of support to the community, help translating the JDocs. Here you will find all informations you need to get started. Please read How to Contribute to Joomla! Documentation. 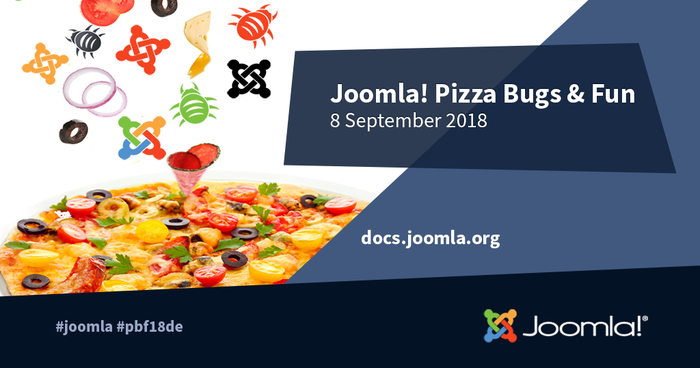 Community blog entry Pizza suppliers love Joomla! This page was last modified on 7 September 2018, at 12:31.